This is a Stainless Steel, laser-cut Bowtie, available in mirror or brushed finish, that fits in the recession in your hood insulation. 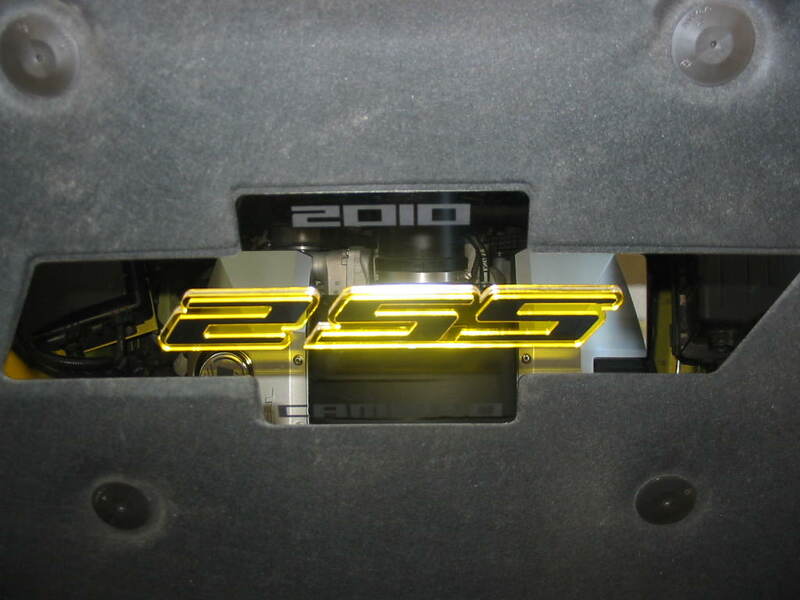 1/8" Acrylic logo/Emblem of your choice pre-applied with 1/ 32" 3M double-sided tape. We allow you to choose a frame color and a fill color for your emblems to give more personalization and allow you to follow your car's color scheme. Yellow, and white are selectable colors in the drop down boxes. Customize by adding up to four (4) lines of custom text for extra personalization. Lines 1 then 2 will be located at the top of the bowtie, and then lines 3 then 4 will be at the base. This can provide a balanced look to the whole piece. There is a maximum character limit per line due to space limitations. We will size custom text accordingly to fit in the available space. If you require more, email us. As a Standard this piece will mount with 4 chrome-plated, allen-keyed, button-head bolts along with matching fastening hardware. View installation instructions HERE. Optionally you can choose hidden bolts, and the installation instructions for this are HERE. We have had some questions about whether these will fit the 2014 and 2015 Camaros. Here is the answer: in 2014 GM modified the hoods on some of these cars, but not all of them. If you look up under your hood and you have the bowtie recession "in the liner" this part will fit your car. If you do not have the bowtie recession, then you have the newer style hood and this will not fit. (Black areas are Frame Color. Please make sure that all of your contact information is correct, including a telephone number you can be reached at in the event that we need to contact you for any questions. The perfect accessory to fill in the empty bowtie "depression" Chevrolet left for us. Quality product, easy installation.